There are eight products within the hydro boost range which include wipes, exfoliators, cleansers, moisturisers and more. I picked up a moisturiser and cleanser to try out. Everything from the range, ranges from £4.99-£12.99. I am really enjoying finding affordable skincare that actually works and makes a difference to my skin. "a refreshing water-gel moisturiser that contains a unique Hyaluronic Gel Matrix to instantly lock in intense hydration and continuously release it as and when your skin needs it throughout the day". It is a very lightweight gel that blends into the skin effortlessly. I find it soaks in quickly and has a cooling feeling. It doesn't feel greasy but leaves an ever so slightly tacky base. I tend to use this every night before I go to bed so it can soak in over night and my skin feels refreshed in the morning. Since using this I have noticed I don't get dry patches as often and when I do use this on them they disappear quickly. If you are after a lightweight cream that cools and hydrates your skin I would 100% recommend this. I think if you suffer with dry skin all over the water gel version might be good for everyday use. I have been using the Neutrogena Hydro Boost Gelee Milk Cleanser for around 3 months now and since taking this photo I am nearly at the bottom and need to purchase another one. This product has to be the best skincare product of 2017 for me! I use this to remove my makeup and holy **** this cleanser is incredible. It has a gel consistency but thicker than the moisturiser gel. It removes my makeup quickly and easily like no other product. I used to use micellar waters to remove my makeup but now all I use is this. It is extremely gentle on the skin which is something I always look for as my skin is very sensitive. Whether you have dry,oily or normal skin you will love this product and your skin will love you even more! 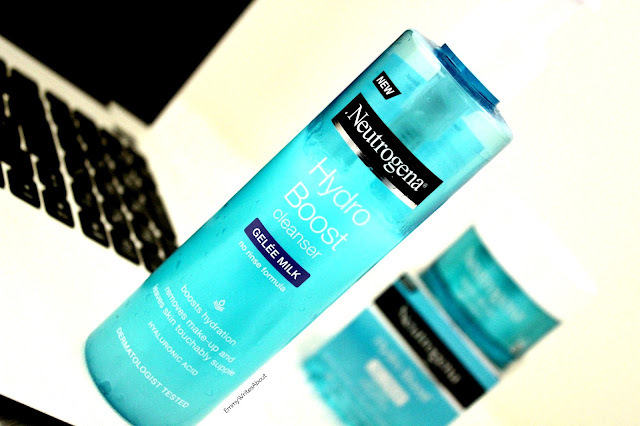 Have you tried anything from the Hydro Boost Range?